It's when your tatted, tunic-wearing waiter offers to scorch out your marrow bone to use as a whisky luge that you realise Mjolner possibly isn't for everyone. But boy, howdy. If you've been wishing and hoping for a viking resto-bar where you can drink from a horn and wave a dagger at your cosplay date, do I have the place for you. Welcome to Mjolner, an invader from Sydney brought to you by the Speakeasy group, the hospitality outfit you know better for bars EDV (purveyor of cocktails in glass shoes and liquid nitrogen martinis) and whisky den Boilermaker House. 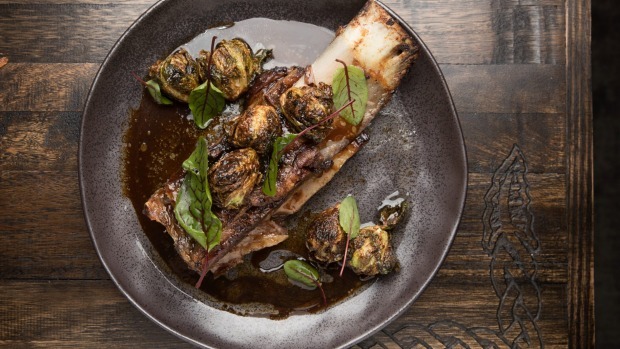 Like Sydney's Mjolner, which opened in 2017 to much enthusiastic knife wielding (and even more enthusiastic theft of their custom trim) Melb Mjolner is gimmick and decor rich. 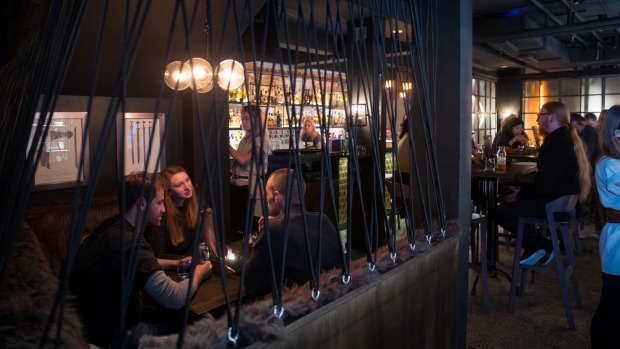 Set in the old Nieuw Amsterdam site, a bar operates in the brick-lined downstairs vault and a restaurant proper takes the upper floor. The prow of a boat juts into reception. Faux and real hides cover all. Your cocktail, beer or mead may be served in a polished horn, whether you want it to be or not. At any point in time, someone is taking a selfie with a helmet or warhammer. If this sounds silly, it is. I have no problem with that. Silly restaurants are in massive undersupply, especially now Dracula's has closed. If anything, it's not silly enough. Dinner starts with a beardy waiter pouring everyone a complimentary shot of burnt honey, mead and vermouth to skol. He comes back later to unroll the impressive leather knife roll for you to choose your weapon – impressive chunks of metal set in intricately carved wood or bone. But just as you're suspending your disbelief and embracing your second horn, they explain this is not a viking-themed venue, it's viking-inspired. "We think this is the kind of place Thor would hang out with mates after battle, with some good drinks and chill beats." Come on dude, you're in a tunic. Go hard or go to Valhalla. Anyhoo: to the good/great. It should surprise no one that drinks from this well-credentialled crowd are good. Boilermaker manager Max Hart is in charge of the bar program and along with a fleet of whiskies, there are cocktails that can read a little wildly (I'll leave the briny, sea succulent toting number for another day) but are well made. The "feeling meady", is a rich, fluffy flip, uniting cognac, and walnut bitters with mead. A sort of bloody mary starring exsanguinated beetroot and tomato juice is super fresh and won't sucker punch your appetite. 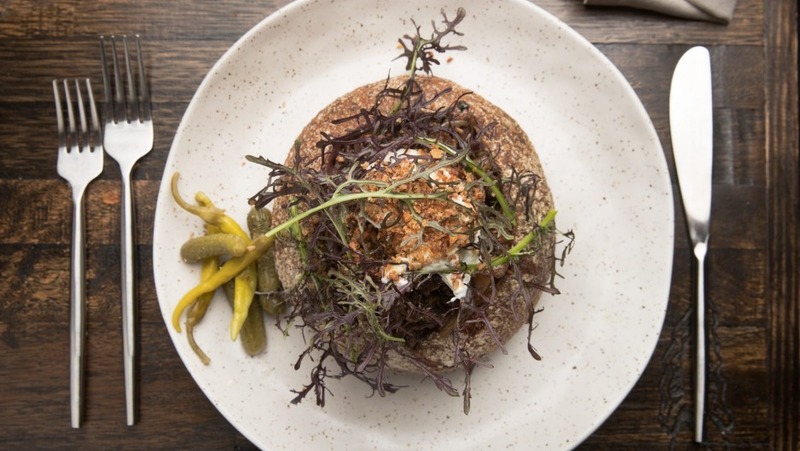 Here at the bar you also have access to the trencher – possibly Mjolner's greatest dish. A sort-of medieval love child between nachos and a dip bowl, a whole malty loaf of bread is hollowed and filled with a hot mess of rotisserie meats, sour cream, and today, bits of roasted celeriac with jus soaking into the bread. It's probably the most thematically carnal dish on the menu, requiring a bit of ripping and tearing. Upstairs, the menu is Nordic-ish (you can get vodka-cured gravlax as an entree) but most dishes wouldn't look out of place in most restaurants: various rotisserie meats; the ubiquitous roasted cauliflower side. An on-theme exception is the bone marrow. Cleaved lengthwise, the rich meat butter has been enhanced with a little Vegemite (condiment of now!) I'm not convinced the "meat dust" (dehydrated charcuterie offcuts and maltodextrin blitzed to a fluffy powder that tastes like sweet chicken salt) works as well as something acidic but the selling point is the upsell, where they torch the bone and pour whisky down the shoot into your mouth. I decline. I recant. I don't regret the resulting roundness the fat gives the whisky. Who knew? Beyond, more spit and polish is needed to make the menu sing. Salt-baked celeriac is a bit dull dressed in a smoked whisky butter that's neither of those first two words. Our sides read well – fresh cucumber spears with a yoghurt dressing flecked with lemon and saltbush, and whole potatoes with a goat's cheese and cornichon dressing – but they're both under-seasoned. Having been given such impressive weapons, it's disappointing to find not a thing to stab. The short rib, optimistically called "the beast", has been cooked beyond tender and collapses on sight. We have to request extra jus as there's little flavour left. The rotisserie chicken is better, dressed with its own reduced juices. The whole thing could use more rip and tear and grit. And 100 per cent fewer snow pea tendril garnishes. Stop it. The floor staff, all power to them, tolerate a lot of selfie taking as they encourage shots and set things on fire. 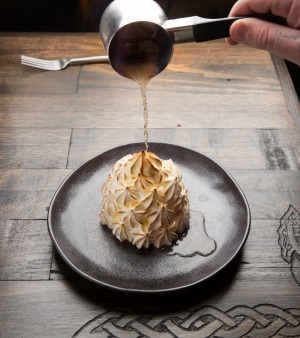 (Speaking of, the bombe alaska served aflame is a beauty, but the mandarin sorbet heart makes for a bit of a wet dessert. The creamy malt parfait is the better bet.) So I can't really blame them for the long waits between courses. I don't actually mind most of Mjolner's flaws. 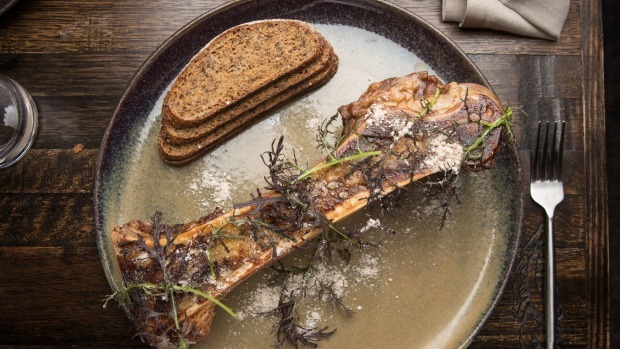 Sure, it isn't the slickest restaurant experience around, but it is Melbourne's absolute premier viking restaurant experience. Come for the drinks, stay for the selfies. Don't take it too seriously and you'll have an ace time. Pro Tip: Bring a good sense of humour or better yet, a Cosplay fan. Go-to Dish: The trencher ($24).